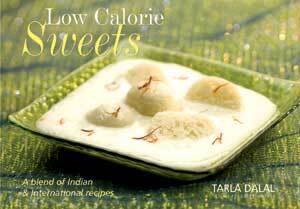 Low calorie sweets is the best solution for those of you who are torn between limiting your calorie and fat intake, and the temptation to enjoy authentic Indian and International sweets at the same time. This book is a compilation of 43 delicacies to satisfy your sweet tooth, the low cal way. It includes both traditional Indian recipes as well as International recipes, and has been divided into distinct sections to help you choose the right dessert for the right occasion. The book is broadly divided into INDIAN SWEETS, which includes sections like Halwas and Barfis, Kheer and Phirni, Traditional Sweets with a Twist and Fruity Favourites and INTERNATIONL SWEETS, which includes Fruit Delights, Ice Creams AND Frozen Desserts, and Choco Treats. Judiciously replace calorie- and fat-laden ingredients with low calorie alternatives as shown in this book, and satisfy your sweet tooth without any guilt. This book offers a chance for even the health conscious to indulge their sweet-loving taste buds. But remember that even low calorie dishes are best eaten in moderation, as an occasional treat!